While President Trump attorney Rudy Giuliani recently told Sky News during an interview that Americans would revolt if President Trump is impeached, none other than former NSA and CIA Director Michael Hayden also recently warned that impeaching President Trump would have 'unintended consequences' and be viewed as a 'soft coup' that would even further delegitimize the already shell-shocked US intelligence community. With most 'awakened Americans' now realizing that the sham Russian-collusion investigation was created by Hillary Clinton and the corrupt faction of the deep state and that the real crimes were being committed by Hillary and the DNC with the politicized FBI and DOJ weaponized to protect them and cover up #ClintonCrimeFamily crimes, as we see in the screenshot we've taken from one comment on this Breitbart story below, Hayden's and Giuliani's warnings may not be too far off the mark. 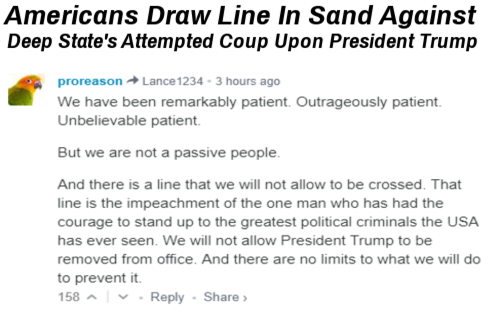 With many of the other top comments also echoing the theme of this one, it's quite clear that Americans have had it with deep state corruption and drawn their own 'line in the sand' against that corrupted faction of the deep state that put Hillary Clinton ahead of America and that 'line' is the impeachment of the one human being in Washington DC with the courage to stand up to long-running government corruption. We have been remarkably patient. Outrageously patient. Unbelievably patient. But we are not a passive people. And there is a line that we will not allow to be crossed. That line is the impeachment of the one man who has had the courage to stand up to the greatest political criminals the USA has ever seen. We will not allow President Trump to be removed from office. And there are no limits to what we will do to prevent it. 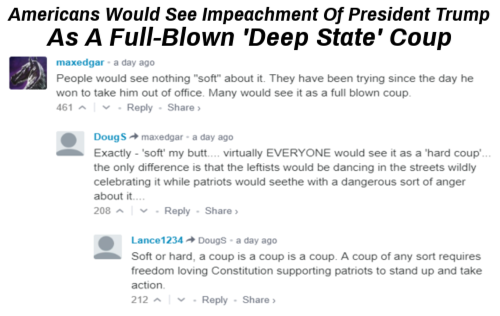 As we see in the additional top comments in the next screenshot below, awakened Americans will see nothing 'soft' about the ongoing and continuous attempts to take down President Trump being made largely at the urging of former US President Barack Obama and election loser Hillary Clinton and as one commenter mentions, while the left would be dancing wildly in the streets at a Trump impeachment, American patriots would be seething with anger with most Conservatives seeing the inaction of the DOJ upon Hillary Clinton crimes while they all out attacked President Trump over a lie as nothing short of a full-blown coup. 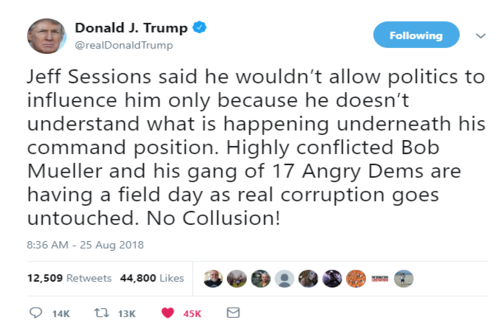 And while we've prayed that God shield President Trump with His Armor with so many different globalists seeking his scalp and weaponized leftists quite literally losing their minds over him, we see in the still ongoing #WitchHunt that Robert Mueller and the 17 angry Democrats have no intention of stopping it. Yet with the entire 'Russia collusion' investigation clearly 'fruit of the poisonous tree' with the Steele Dossier proven to be a concoction of Hillary, the mere fact that the investigation continues to this day, taking down former President Trump allies such as Paul Manafort shows this could go on for a long, long time if Democrats have their way. It's long been said "a grand jury could 'indict a ham sandwich,' if that's what you wanted" and with seemingly nothing standing in the way of Robert Mueller finding at least something tiny wrong with President Trump or his campaign hinting that the deep state won't let this rest and allow President Trump to do the job he was elected to do, we thoroughly understand why former US Presidential candidate Patrick Buchanan recently predicted that America is in for a hellish year. The answer lies in the very nature of modern federal criminal laws, which have exploded in number but also become impossibly broad and vague. 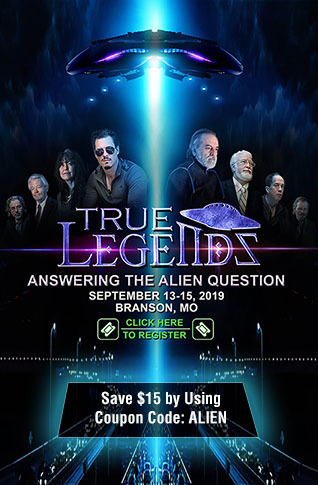 In Three Felonies a Day, Harvey A. Silverglate reveals how federal criminal laws have become dangerously disconnected from the English common law tradition and how prosecutors can pin arguable federal crimes on any one of us, for even the most seemingly innocuous behavior. The volume of federal crimes in recent decades has increased well beyond the statute books and into the morass of the Code of Federal Regulations, handing federal prosecutors an additional trove of vague and exceedingly complex and technical prohibitions to stick on their hapless targets. The dangers spelled out in Three Felonies a Day do not apply solely to “white collar criminals,” state and local politicians, and professionals. No social class or profession is safe from this troubling form of social control by the executive branch, and nothing less than the integrity of our constitutional democracy hangs in the balance. Will the deep state actually attempt to use such tactics to take down President Trump on what amounts to a drop in the bucket compared to what Hillary and the corrupted faction of the deep state did? Certainly if so, Americans will have ABSOLUTE proof that the rule of law doesn't apply equally to everybody and if it doesn't apply equally to everybody in this Constitutional Republic we live in, it shouldn't apply to anybody. With President Trump recently calling out Attorney General Jeff Sessions on just that point, the total and complete hypocrisy that we've seen by the Department of Justice and FBI completely neglecting to hold to the rule of law when it comes to Hillary Clinton, Barack Obama, and the Democratic party has been deafening. 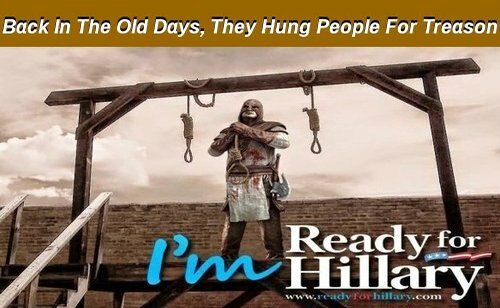 How can America EVER return to the 'rule of law' when the 'rule of law' has been weaponized to protect Hillary Clinton while taking aim at Conservatives, Christians and those who still support the US Constitution? And the silence on the corruption and collusion by the deep state and Democratic party by the #FakeNews mainstream media also tells us a tale that they'll never tell. The mainstream media has been fully co-operating with and facilitating the 'take down of America'. Hence the extremely appropriate label: ENEMY OF THE AMERICAN PEOPLE. 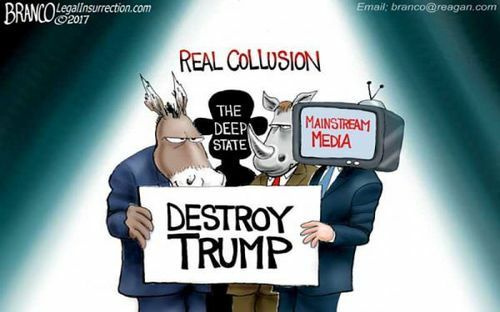 And with the 'real collusion' during the election having taken place between the Democratic party, the deep state, the never-Trumper's still left over as a dying breed within the Republican party and the mainstream media/big tech monster, we see the never-ending attempts to silence those who go against the globalists agenda as a last-gasp attempt to save their 'new world order' and keep Hillary and the rest of the corrupt out of prison. As Mike Adams tells us in the first video below from Real.Video, with the total hypocrisy that we've witnessed with Hillary Clinton having committed crimes that would have gotten any other American in this country thrown in the slammer for a very long time due to partisan political hacks leading the investigation into her, America can't possibly return to 'the rule of law' if we suddenly have two 'classes' of citizens, regular ordinary every day, deplorable Americans and the 'untouchables' like Hillary Clinton and Barack Obama. And for those who may have missed it, in the 2nd video below, CIA whistle blower Kevin Shipp joins USA Watchdog's Greg Hunter to talk with us about the ongoing attempted coup upon President Trump with the DOJ and FBI seemingly in cohoots with the MSM to cover up the phony Trump dossier that was used to begin this entire investigation with the globalists stopping at nothing to take down President Trump and thus, take down America. As this new story over at the American Thinker that Steve Quayle linked to on his website this morning reports, much of the witch hunt that we've been witnessing towards President Trump and his supporters is really a co-ordinated attempt to deflect attention away from the real traitor's to America, those within the deep state who've sold away their allegiance to America to embrace global government while surrendering US sovereignty. And should Hillary Clinton and the corrupted faction of the deep state remain unpunished for their laundry list of crimes while President Trump is taken down for what amounts to some kind of technicality, ALL of America will finally have absolute proof that we are no longer a 'Constitutional Republic' but the globalists have successfully transformed our nation into a banana republic where corrupt politicians go untouched. Treason is narrowly defined in the Constitution, restricted to wartime. U.S. Constitution, Article 3, Section 3: "Treason against the United States, shall consist only in levying War against them, or in adhering to their Enemies, giving them Aid and Comfort." True, but I contend we are at war, a bloodless war against a globalist tribe. Hillary Clinton's not a singular threat to our democracy; she's part of a cabal that's been working for decades to end democracy, to subjugate Americans to global rule. Fact is, we shouldn't be arguing John Brennan's right to a security clearance; we should be advising him of his right to remain silent. Brennan was and is a lead player in the attempt to overthrow the United States government. A palace coup is "the non-violent overthrow of a sovereign or government by senior officials within the ruling group." The coup has been obvious since 2016, when the cabal, confident of victory, dropped their façade. They flaunted the FBI's two-tier justice system, accepted the Democrats' rigged primaries, gaslighted voters with fake polls, and the list goes on – an occupied government that no longer cares who sees its machinations. SECOND HALF OF OUR ANNUAL PAYMENT FOR ANP DOMAIN, HOSTING AND DEDICATED IP IS DUE THIS MONTH (AUG.), soo..